Sorry, this free book is back up to full-price. 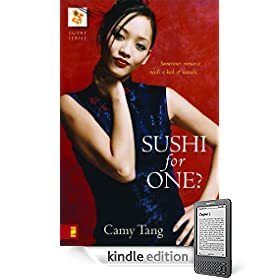 Download this free novel “Sushi for One?” (a $10.99 value) by Camy Tang. Thanks goes to Need A Nap 2 for recommending it, she said “It’s a wonderful book and very funny plus you get to learn about all kinds of Asian foods and family dynamics“. I wanted to share it with you while it’s FREE for a limited time. For more free books checkout the Bestsellers in Kindle Store. What other free Kindle digital books are available? Check out all of the FREE Kindle fiction books and consider it your digital library where there is never a late fee. Thanks for posting about this! I appreciate it!Sunnymum, I'm so glad you enjoyed it! Thanks!Rhiana, I hope you like it! Thanks! I read the free kindle books on my Iphone. I love to hear about new ones. I don't have a Kindle, but just wanted to add that I enjoyed this book! Thanks!